Regina Myer is President of the Downtown Brooklyn Partnership, a not-for-profit local development corporation that is tasked with supporting Downtown Brooklyn’s emergence as New York City’s center for innovation, creativity and entrepreneurship, and serves as the primary champion for Downtown Brooklyn as a world-class business, cultural, education, residential and retail destination. Ms. Myer was previously President of Brooklyn Bridge Park, where she led the transformation of a formerly industrial waterfront stretching 1.3 miles along the East River into an 85-acre civic space for all New Yorkers. Brooklyn Bridge Park represents one of the most significant public investments in NYC of the 21st century. Under her leadership, the Park received numerous awards from organizations such as the Municipal Art Society, American Institute of Architects and the American Planning Association. 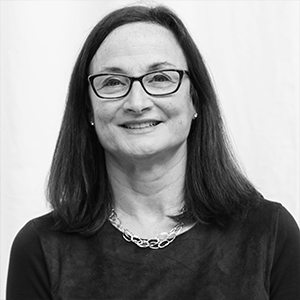 From 2006- 2007, Ms. Myer served as senior vice president for planning and design at the Hudson Yards Development Corporation. Prior to that, she was the Brooklyn Borough Director for the New York City Planning Department, where she directed the comprehensive redevelopment for two miles of the Greenpoint/Williamsburg waterfront, the rezoning of Downtown Brooklyn for high density office and residential space, and numerous other neighborhood rezoning efforts. She received her BA and Masters in Urban Planning from the University of Michigan, and resides in Park Slope, Brooklyn.